At MIT’s 2016 Open House last spring, more than 100 visitors took rides on an autonomous mobility scooter in a trial of software designed by researchers from MIT’s Computer Science and Artificial Intelligence Laboratory (CSAIL), the National University of Singapore, and the Singapore-MIT Alliance for Research and Technology (SMART). The researchers had previously used the same sensor configuration and software in trials of autonomous cars and golf carts, so the new trial completes the demonstration of a comprehensive autonomous mobility system. A mobility-impaired user could, in principle, use a scooter to get down the hall and through the lobby of an apartment building, take a golf cart across the building’s parking lot, and pick up an autonomous car on the public roads. The researchers’ system includes several layers of software: low-level control algorithms that enable a vehicle to respond immediately to changes in its environment, such as a pedestrian darting across its path; route-planning algorithms; localization algorithms that the vehicle uses to determine its location on a map; map-building algorithms that it uses to construct the map in the first place; a scheduling algorithm that allocates fleet resources; and an online booking system that allows users to schedule rides. Using the same control algorithms for all types of vehicles — scooters, golf carts, and city cars — has several advantages. One is that it becomes much more practical to perform reliable analyses of the system’s overall performance. Furthermore, with software uniformity, information that one vehicle acquires can easily be transferred to another. Before the scooter was shipped to MIT, for instance, it was tested in Singapore, where it used maps that had been created by the autonomous golf cart. Finally, software uniformity means that the scheduling algorithm has more flexibility in its allocation of system resources. If an autonomous golf cart isn’t available to take a user across a public park, a scooter could fill in; if a city car isn’t available for a short trip on back roads, a golf cart might be. “I can see its usefulness in large indoor shopping malls and amusement parks to take [mobility-impaired] people from one spot to another,” says Dan Ding, an associate professor of rehabilitation science and technology at the University of Pittsburgh, about the system. 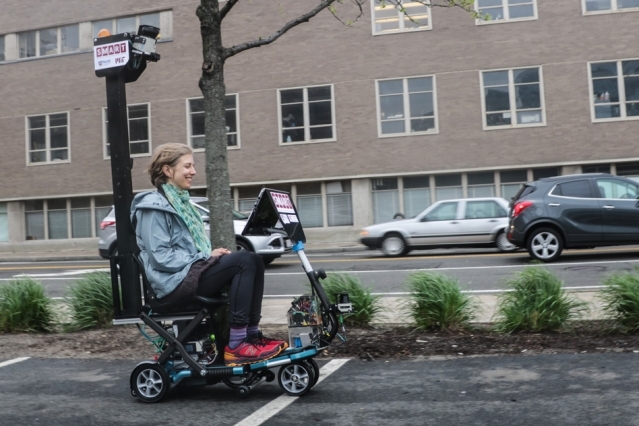 The scooter trial at MIT also demonstrated the ease with which the researchers could deploy their modular hardware and software system in a new context. “It’s extraordinary to me, because it’s a project that the team conducted in about two months,” Rus says. MIT’s Open House was at the end of April, and “the scooter didn’t exist on February 1st,” Rus says. The researchers described the design of the scooter system and the results of the trial in a paper they presented last week at the IEEE International Conference on Intelligent Transportation Systems. Joining Rus, Pendleton, and Ang on the paper are You Hong Eng, who leads the SMART autonomous-vehicle project, and four other researchers from both NUS and SMART. The paper also reports the results of a short user survey that the researchers conducted during the trial. Before riding the scooter, users were asked how safe they considered autonomous vehicles to be, on a scale from one to five; after their rides, they were asked the same question again. Experience with the scooter brought the average safety score up, from 3.5 to 4.6.